You can love him or hate him… but regardless of which side you fall on, Donald J. Trump is our next President. The Electoral College results were undeniable. But on election night, a lot of people were surprised by what was unfolding in front of their eyes. Dumbfounded might be a better word for it. The other side was certain of their victory even before the first vote was cast. But “The Donald” seemingly came out of nowhere, winning one key state after another until much of the world was left in shock, wide-eyed and open-mouthed. What happened? How did he come out of “nowhere” and win a decisive electoral victory like that? It wasn’t happenstance, it wasn’t a miracle, and it wasn’t dumb luck. It was strategy. 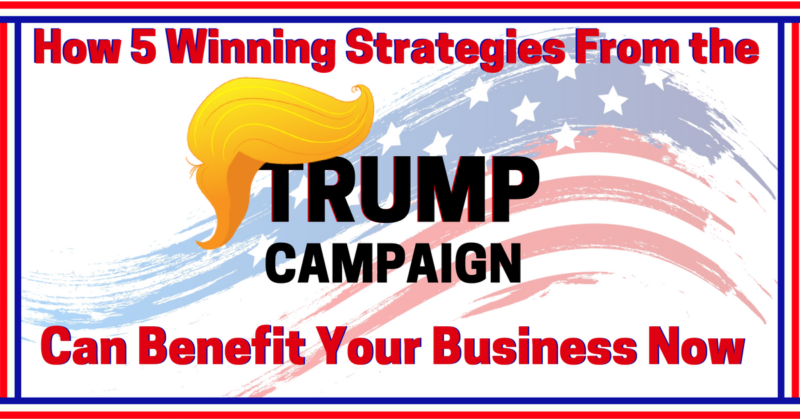 The Trump Campaign employed several key strategies that ultimately led to his victory. These 5 strategies won hearts and minds, captured the attention of his audience, and spoke to them in a way no other politician had ever done before. You don’t have to be a fan of the man to learn from these strategies and put them to use in your life… and your business. In fact, you can use these exact same 5 strategies in your contracting business to boost your profits and dominate your market. One effective way to get attention and shift the conversation to the areas you want it shifted to is to break the rules and go against the grain. Trump didn’t campaign like other politicians. He relentlessly attacked the status quo and (loudly) called out the things he believed were wrong. In the primary and in the election itself, he beat the drum against all the “normal politician stuff” that the American people have become tired of and frustrated with throughout their lives. Many disliked his tactics, but the bottom line is that they worked. If you want to lead and win, do things differently. The worst thing you can do in life or in business is to be just another version of the usual. Don’t be Vanilla. Be Savannah Butternut Banana Swirl! A great way to stand out in your market is to break away from the old, tired model of selling parts and labor. Trump knew what the people wanted ahead of time, and he chose the topics he’d run on in advance. Early on, his own party didn’t even want to endorse him based on some of his messaging. But instead of caving, Trump ignored the status quo politicians and listened to the right people – the ones who could get him elected. This included a small group of trusted advisors who shared his vision and more importantly it included millions of middle class people who were sick and tired of being overlooked and were losing their jobs. The lesson for you here is: Listen to the people who are most affected by the problem. Provide the solutions to the people who are suffering the most from the current status of poor design, neglect, installation or repairs. While his competitors wanted to attack him regarding his lack of experience in politics, the type of language he used, and decisions he made in the past, Trump would always direct the conversation back to the things he wanted to talk about. From the moment Trump decided to run, in his mind, he had already won. There was nothing that was going to stop him from achieving his goal. That’s called complete and total commitment. No matter how logical or reasonable the argument was to attempt to disqualify Trump, he believed and was completely sold on the fact that he would win. Trump and his team had a plan they were deeply committed to. They were all in. They rejected the status quo. They believed 100% in their plan, and they weren’t afraid to talk about the things they feel would make America great again – even if those things were wildly unpopular with a lot of people. The criticism and ridicule rolled off their backs and at times even fueled their enthusiasm to win even more. 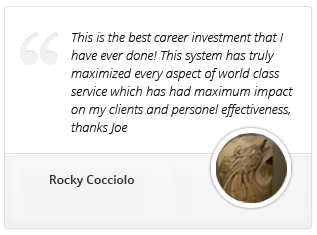 That’s the kind of commitment that builds world-class contracting businesses. You need an iron-clad plan… and then you need to work that plan with total commitment every day until you reach our goals. If you’re wondering what kind of plan can create these types of results in your business, you can find all the details right here. That’s so true. And it’s all about emotion. It’s about how people feel and what they believe. The Trump campaign triggered passion in the hearts of the voters. He reminded them of better times and got them fired up to think that the “good times” in this country could come back. It created passion and emotion – not logic. Emotion is more powerful than logic, and it also drives more decisions than logic. You’ll do very well in the contracting business if you learn to make what you do about emotion. Make it about the customer, their family, their safety, and their peace of mind. If you do it correctly, you’ll quickly see how much more important those things are to your customers than saving a few bucks, a brand name of equipment, or a payment plan. If you’re ready to learn how to differentiate yourself, know exactly what your customers want, control the conversation in your market, create a plan you can commit to, and capitalize on what’s really important to your customers, then it’s time you took a hard look Total Immersion Program. With the new year just a couple days away, we’re taking reservations for our 2017 Total Immersion Sessions. There are several dates available, so one of them is sure to work for you and your team. Click here or call 877-764-6304 to get all the details and to save your seat for our upcoming sessions. Great post Uncle Joe! Please keep them coming i find your logic to be very emotional!